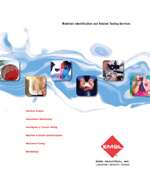 While EMSL Analytical, Inc. has a network of fully-equipped environmental chemistry laboratories across the country, there are numerous instances where typical testing methods don’t give a client the information they might need. Beyond knowing the relative levels of concentration or exposure of a known analyte, it’s often crucial to understand the nature and source of the material at that site. 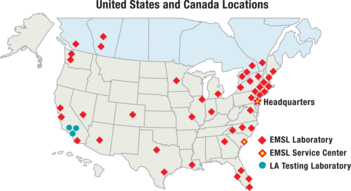 Whether it is trying to differentiate between multiple potential sources contributing to a site issue or examining the fine differences between multiple oxidation states of a metal or structure of phosphate compounds, a more detailed, targeted forensic analysis can serve to provide these answers when traditional methods fall short. Focusing on advanced, non-destructive micro-analysis and chemical speciation, our range of environmental forensic services are designed to allow for a far more detailed analysis of your environmental samples. Using chemical spectroscopy methods coupled with high-resolution microscopy, fine details of a suspect sample can be examined in exacting detail – in many cases without having to consume or alter the sample significantly. Using EDS/WDS/XRF, small residues or individual particles from soil, air or water samples can be examined for elemental composition. Similarly, Raman, IR or fluorescent spectroscopy can help identify organic materials. Using these techniques – directed, specialized analysis using high-resolution chemistry tests – can then be deployed to gain additional insight about the sample materials. There are many advantages of performing two-phase, direct examinations including maintaining the association between various materials and particles, harvesting clues from particle or residue morphology and retaining samples that can be re-examined in case of the need for further scrutiny. With our experience and access to a variety of analytical methods, EMSL can assist you with your complex environmental investigations, serving as your testing partner from inception of a testing need through full documentation and full data reporting on the findings.